Faculty, postdoc, and graduate students in our group actively mentor undergraduate students at UCLA and beyond. 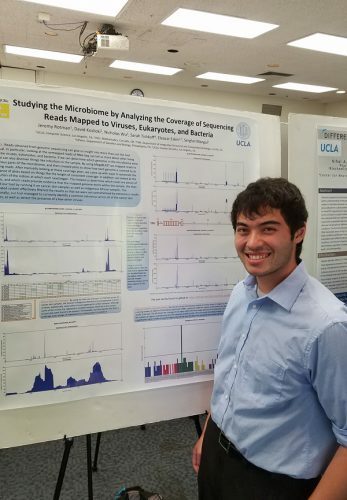 UCLA undergraduate Jeremy presents research results at a 2016 poster session for B.I.G. Summer. Undergraduates at UCLA should consider obtaining a Bioinformatics Minor. In addition, there are many research opportunities for Undergraduate students in Bioinformatics at UCLA. There are additional opportunities for incorporating courses into a degree plan. School of Engineering students can take advantage of the Computational Genomics Technical Breadth Area and Computer Science students can take advantage of Science and Technology electives.